"Plan a low-carb taco night with these irresistible, keto-friendly beef tacos made with cheese taco shells, avocados, tomatoes, and lettuce." Preheat oven to 350 degrees F (175 degrees C). Line 2 baking sheets with parchment paper or silicone mat. Spread Cheddar cheese into four 6-inch circles, placed 2 inches apart. Bake in the preheated oven until cheese melts and is lightly brown, 6 to 8 minutes. Cool for 2 to 3 minutes before lifting with a spatula. Place over wooden spoon handle wrapped in aluminum foil balanced over 2 cups/cans. Let taco shells cool completely, about 10 minutes. Cook beef in a skillet over medium-high heat until browned, stirring often to separate meat, about 7 minutes. Season with taco seasoning, salt, and pepper; cook for 1 minute more. 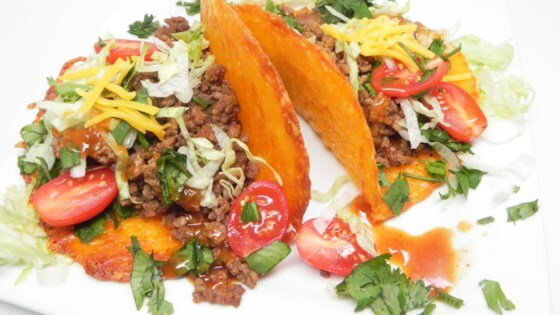 Divide beef mixture among cheese taco shells. Top with avocado, lettuce, Cheddar cheese, and tomatoes. Cheesy, savory, and beefy tacos are on the menu tonight! I would next time add less salt and add sour cream. I also used Munster and parmesan cheese for the shells since I did not have enough cheddar and added jalapenos. These were so good! Hubby and I recently started the keto diet. We're doing very well and dishes like this are helping us stick to it! AMAZING. Very rich, I could only eat one, but filled with delicious goodness (taco meat, avocado, tomatoes and sour cream, it is ammmmazing. Loved the flavor -- created with my own spice mix and the cheese taco shells were great. A bit messy to figure out how to do it the first time but thanks for the tips you gave us. No changes and yes definitely will make them again!! One of our favorite Keto quick dishes, easy to make. This was awesome, easy and super tasty! Will make again asap!